First, let me just say that I am uber excited about this giveaway!! It is being brought to you in part by a very generous half.com seller, Monster_Mart. A while back, I ordered this book for one of classes this semester. It's one of the only books I knew of that had a brief history of patterns and I needed some information on '40s patterns. Since I have such a weak spot for books, I opted to buy it rather than rent it from the library. My book came in a timely fashion and I really enjoyed looking at all the wonderful photos, not to mention learning a bit more about vintage patterns. Well, last week I received the book in the mail again. I contacted the seller to see if they would agree to let me keep the second copy as a giveaway for my blog and they did!! Thank you soooo much Monster_Mart!!!!! This is such a great book and resource, I highly recommend it; especially since you can get a used copy for $20 or less. I am also giving away a '40s pattern, it's complete but the envelope is a little torn. It's such a cute dress with a lot of different options to it with the collar. 1. Comment on this post about anything vintage sewing or fashion related. 1. Become a follower and comment that you have. 2. Repost this post on your blog and comment that you have. 3. Facebook or Tweet about this giveaway and comment that you have. Your blog is incentive for me to start working out and lose weight so I can fit into some vintage clothes! Love the blog! And that book looks fabulous. Thanks! Thank you for the opportunity to have a chance at winning what looks like a fabulous book. I adore vintage fashion, and I have been collecting patterns even though I don't sew! I used to pay my sister to make clothes for me when we were in high school. She was a much better seamstress than me, and it think it had a lot to do with patience! She still has some of the patterns from things she made back then, it's so fun to look through them and go "Oh, I remember this dress!". Next time she comes over, we are going to get the sewing machine that belonged to my mother-in-law out of the closet so she can help me figure out how to thread it and work the bobbin and all of that! Then I will attempt to tackle SOMETHING. That looks like a fabulous book! i really should get back into vintage sewing! Your blog is very inspirating to me. I love vintage fashion, especially 50s and the petticoats. My grandmother had really elegant clothes from that time but unfortunately they were lost after she died. Luckily I found her vintage jewelry which became my treasure. I've been working on organizing my (soon-to-be) sewing room, so that I can try my hand at sewing from vintage patterns. Maybe I'll finally use the swell patterns I've got, instead of just looking at them wistfully! Pssst! Inky sent me!! I have been longing for that pattern book, I have the 50s one but still have never gotten the 40s one for some reason!! And now that I'm all about sewing up the 40s patterns, well, this giveaway is me all over! Ew, my verification word was BOWEL! Inky sent me too! I've been sewing from vintage patterns for a few years now and it's an addiction. Following, bloged about and posted in FB status! Thanks. Well I'm from Italy and I hope it's not too far away to enter your giveaway! I'm also going to write about it on my blog...but in italian :-) ! I'm following you now! I'd post you up on my blog but I think the only person who reads it is my mom. Does it count that I dreamt about this book on Saturday night? I am a vintage fan, and have an undergrad daughter Emily who adores 40s fashions (and has the perfect shape for them). She and I used to sew together before she started college, and we visit blogs together when she is home. You are now added to our list, and thank that CherryBubbles girl, too-she gives me the best recommendations! GAH! I have had this book on my Amazon wishlist for a year now. My husband and I are reenactors and met at a WWII dance, so I have a soft spot for 40s fashions. I also sing with a vocal trio that does 20s-40s songs and this book would really help for clothing ideas. Fingers crossed! oh - so lovely, i looked at a few patterns on ebay and now i feel thoroughly inspired, time to bug my ma to let me use her sewing machine! and i'm now a follower - thanks to Shrinky Inky! and now all the facebookers in my school have been enlightened! actually - i know i just posted 3 times but i think people on this post deserve it more than me. Inky sent me. I'd love to learn how to sew my own 40s inspired frocks. Just found your blog for the first time from Past Life Vintage in a Modern world!!! So I'm a new follower!!! 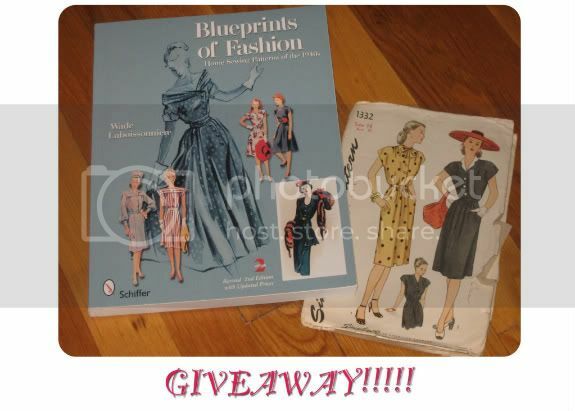 I love sewing vintage so this giveaway is great!!!!! and here is a video tutorial for you all about how to do faux pin up bangs for those of us that don't have bangs!! It's by Pin Up Sweet Shoppe and I love her tutorials!! I made a post on my blog for your giveaway! But I realized I didn't talk about sewing in my previous post *_*! Well I love vintage clothes and I realized the only way to have one perfect for me, is doing it by myself using a vintage pattern. I'm just learning how to sew from my grandparents! I'm very happy to spend time with them and also to use their original sewing machine from '40s! Hi, new follower here! I'd love to sew that dress pattern you have, it looks so nice for a casual day out. Fingers crossed! New follower as well! I've been eyeing this book for quite some time ;) Lovely blog, I like the vintage film clothing posts! What a great giveaway. This book is in my wishlist on Amazon so that is perfect. I have yet to sew an actual vintage pattern only reproductions I have quite a few vintage patterns I just need to learn how to properly grade them. I already followed your blog via RSS feed but I just added you to the other thing. Sorry - I forgot to add, I'm also a follower! Inky sent me! I studied fashion design and am teaching youngest, age 25, to sew because she loves the vintage designs and is an ardent thrift store shopper. We hope to refashion some of her great finds. Wow what an awesome giveaway ! Thank you for sharing this delightful opportunity with so many. I'm still a bit wobbly with the pedal on the machine, i keep making the needle whizz off every so often! I love seeing fellow bloggers share their enthusiasm for vintage anything, especially vintage fashion! It makes me so excited. love the darling pattern too!!! What a exciting give away! The pattern looks like a find. I've been looking for a 40's dress pattern that would fit my skills. What fun if I could win it! Oh, and I became a follower too!